Sweet Land, the Musical appears on a small stage, yet the actors convey expansiveness while making the audience feel like part of the town. When Sweet Land was released in 2005, the independent film written and directed by Ali Selim quickly gained critical acclaim. Set in the Midwest farmland prairie of Minnesota in the 1920s, it is the story of a small Norwegian immigrant community that is jolted when a young German woman comes to settle there in an arranged marriage. It is a sentimental tale of both love and friendship that flourish as the community learns to open its hearts and minds to an outsider. 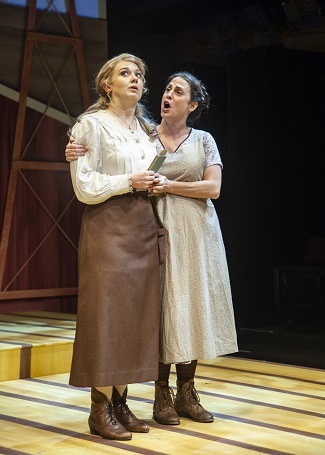 The story struck a chord with the creators of a new stage version, Perrin Post and Laurie Flanigan Hegge, and they knew immediately that they wanted to craft it into a stage play. A couple of Saturdays ago, I had the pleasure to chat with Post and Hegge when they came to Seattle for the West Coast premiere of Sweet Land, the Musical at the Taproot Theatre in Seattle’s Greenwood neighborhood. It was a project over 10 years in the making, and as I would learn later that evening, well worth the wait. Both natives of Minnesota, the two playwrights have a strong affinity for the roots of the play. Post told me about her proud Swedish-Finnish heritage, and Hegge is Scandinavian by marriage. A chance connection gave them easy access to the film’s screenwriter. One of Hegge’s son’s friends had appeared in the movie and set up a conversation with Selim, and without hesitation he granted the two women the stage rights. They learned that Selim had based his filmscript on the 1989 short story “A Gravestone Made of Wheat” by Will Weaver, another Scandinavian American from Minnesota, and soon he was also on board to provide inspiration and support. The basic plot of Sweet Land is simple: Olaf Torvik is a Norwegian immigrant farmer on the prairie. He is hard working and successful, but lonely. His mother back home in Norway had found Inge, a young German war orphan, and understands that she is the one for her son. She sends Inge to America, but upon arrival, it is learned that she is German, not Norwegian, and she is not accepted. Even worse, her only papers indicate that she may have socialist leanings, and the locals treat her with even more suspicion. Molli Corcoran and April Poland at Taproot Theatre. But the determined Inge is not willing to give up. Against all advice, she goes to Olaf’s farm, and with time she falls in love with both the land and its owner. They gain the support of Olaf’s friend Alvin Frandsen and his Irish-born wife Brownie, who strive to teach Inge American ways. Unable to marry because of the authorities, Olaf and Inge buck all common conventions and live together as husband and wife. They remain on the land they love and choose to be buried there in the wheat fields, leaving a legacy of love for their son, Lars. Wheat is central to the meaning of the play as symbol of fertility, bounty, and resurrection: once it is successfully harvested, the community has come together and will thrive for generations to come. Early on, the playwrights understood that their stage version was destined to become a musical. Whereas the film lives largely from its cinematic scope, with gorgeous views of sweeping landscapes and close-up shots to convey inner life of the protagonists, the stage play takes life from music. Quiet unspoken moments are conveyed by songs that sound out as a stream-of-consciousness narrative. At other times, the story lends itself naturally to the music, as with the big community barn dance. Fortunately, the writers were able to find the right collaborator with Dina Maccabee, whose score fits perfectly with Hegge’s lyrics. Much of the music finds its inspiration in Scandinavian folk, as well as the vaudeville and ragtime genres popular in the 1920s. The orchestration has been scaled down to a small ensemble that appears onstage: strings, woodwinds, piano, percussion, and of course an accordion. 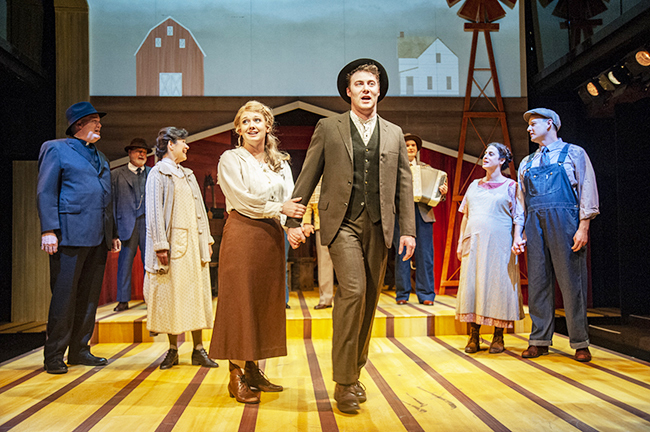 Sweet Land, the Musical premiered last year in St. Paul to rave reviews, and then toured the rest of the state, lovingly received by audiences wherever it went. Theater in the Twin Cities took the script to the National New Play Network, and with time it came to the attention of director Karen Lund, Associate Artistic Director at the Taproot Theatre, a match made in heaven. The topic of immigration is timely, and with the opening of the new Nordic Museum in May, the play seemed like a natural choice for Seattle audiences. Lund reached out to the Minnesota playwrights. Soon she and Hegge realized that they had studied together at the University of Illinois at Champaign-Urbana together—another personal connection. At the Taproot, Sweet Land moved onto a much more compact stage, with a thrust configuration, in which the audience surrounds the actors’ arena on three sides. Scenes are set with a minimum of props and the projection of simple images above the stage: a train station, a farmhouse, a barn, a church, a courthouse, etc. With the audience so close to the actors, there is a sense that they, too, are part of the rural Norwegian community of the play. While the scope and grandeur of the farmlands is lost in a theater setting, the actors are able to convey the expansiveness by looking beyond the audience into the fields, as the sounds of barnyard animals are at times heard in the background. Theater-goers are drawn into the immediacy of the moment with an intimate setting that nonetheless creates the illusion of openness needed to convey the story. Virtually every aspect of the Seattle production has been well conceived and executed—the casting, the stage design, orchestra, the sound, the lighting, and the choreography—to make for a perfectly enjoyable evening at the theater. Those who liked the movie Sweet Land—and those for whom it’s new—will undoubtedly fall in love with Sweet Land, the Musical. Ten years ago, Post and Hegge had no idea that their play would become more than a regional production, but it has proved to be much more. With its energetic, emotional music and universal message, Sweet Land, the Musical brings the message of the tolerance, love, and humanity that we need to keep the American Dream alive. Sweet Land, the Musical will play on the Jewell Mainstage at Seattle’s Taproot Theatre, 204 N. 85th St. through Aug. 18. For tickets and more information, call (206) 781-9707 or visit www.taproottheatre.org. Crab feed and auction for the Leif Erikson Lodge Scholarship Fund in Seattle, Wash.